Many of us are familiar with how over-pruning can take away much of the beauty of flowering shrubs, in addition to contributing to their early death. But, have you ever wondered what they look on the inside? I found this ‘ugly’ example alongside the drive-thru of Taco Bell. It isn’t pretty, is it? The side of the ‘Green Cloud’ Texas Sage was sheared away because it was growing over the curb. The result of planting the shrub too close. You can see the thin layer of leaves that cover the shrub and the dark, interior where sunlight seldom reaches. 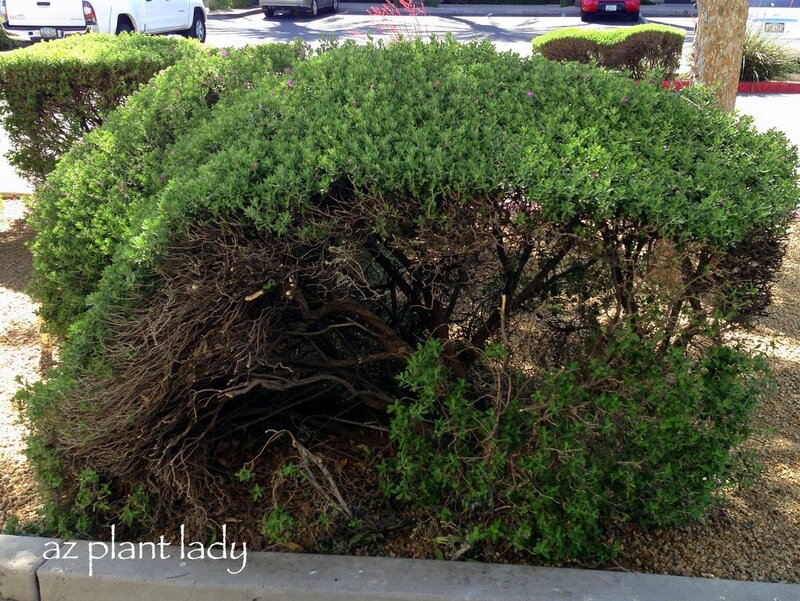 If this resembles your shrub(s), you can fix them. Below, is a link to a previous blog post of how to do ‘renewal pruning’ on your desert flowering shrubs and what they look like as they grow back. You can still do this in April for your Cassia (Senna species), Sage (Leucophyllum species), Ruellia, Fairy Duster (Calliandra species) and Lantana shrubs.